Via the September edition of Golden Boy on ESPN took place on September, 13, 2018, live from the Hard Rock Hotel and Casino in Las Vegas, Nevada. 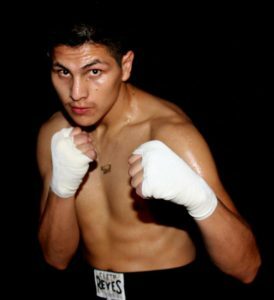 Pablo Cesar Cano, 31-7-1, 21 KO’s was in action against Ruslan Madiyev, 12-1, 5 KO’s, in a 10 round super lightweight fight. Cano started out as the aggressor pressing forward on the Kazakh early as he threw and landed more punches through the first round. Madiyev looked a bit more comfortable early in the second as he used his jab and landed a number of overhand rights along with lead left hooks. For the most part both fighters had their moments for the remainder of the round. In the third the fight played out to a similar script as both had their moments. Madiyev landed a nice uppercut about a minute into the round. Cano continued to press forward though Madiyev continued to fire back. Cano was able to land a solid combination to the body and head midway through, the best combo of the fight. In the fourth round the broadcast team mentioned that the referee had ruled that there was an accidental headbut in the previous round causing a cut on Cano. Cano looked to hurt Madiyev with a multi punch combination that was capped by a solid right to the head in the fourth. As the round wore on Cano continued to dig into the body with combinations that landed cleanly. Cano closed the round with another solid four to five punch combination as well. The sixth saw Cano continue to press forward throwing punches in bunches. Madiyev had many moments in which he didn’t throw punches at all as Cano remained active throughout the rounds up to this point in the fight. Madiyev was able to land a solid overhand right on two occasions in the fight with the second knocking Cano’s mouthpiece out as he pounced forward. The two fighters butted heads again but this time Cano had a ton of blood gushing from his face. Referee Russell Mora was forced to stop the fight due to large gash on Cano’s head in the sixth round. The cut was ruled to have been caused by a punch by the referee at the time of the stoppage. The replays clearly showed that the cut was caused by a headbutt. Head of the Nevada Commission, Bob Bennett, spoke with referee Mora and it was ruled that the fights would go to the scorecards. Officially, the scores were 49-46 from all three judges in favor of the technical decision for Cano. Cano put on a brilliant performance through the first part of the fight and deserved the win. For Madiyev, he’ll have to go back to the drawing board as he looks to make the necessary changes to improve upon his showing. After the fight Bob Bennett mentioned that regulations were being put in place to make replay reviews a part of boxing as they are in all major sports. Stay tuned fight fans as RSR will continue to bring you the latest and greatest in boxing action.